The environmental paperless monitor provides PC-based remote surveillance of environmental conditions in critical HVAC applications such as computer server rooms, clean rooms, laboratories, museums, warehouses, or any remote facility. View and record temperature and relative humidity. Data points can be transferred to PC via RS232 serial port for further analysis. 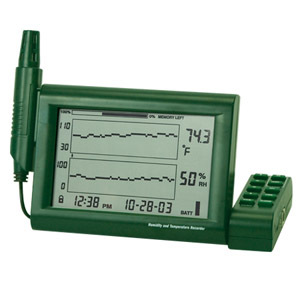 The remote (detachable) probe senses the ambient conditions while the LCD graphs and provides numerical representation of the readings. Programmable audiovisual alarms alert the user when ambient conditions reach alarm presets. The optional alarm module permits automatic relay switching when alarm presets are reached. The software is a full-featured program that allows you to set up all data logger functions including sampling rate, logging duration, start mode, logging mode, and high and low temperature alarm values. 참고: Comes complete with operator’s manual, built-in stand, detachable probe with 1 m (3.3') cable, RS232 cable, RS232 to USB adaptor, LabVIEW—based PC software, 100 to 240 Vac, 50/60 Hz adaptor, and 3 “AA” batteries.